Kama have been designing and building their range of sailing boats and dinghies since 1988. Their company is very well established in their domestic market (Poland), where they regularly take part in domestic sailing fairs. In January 2008 their range of sailing boats will be making its debut on the International Scene at the Yachting Fairs in Duesseldorf. Their range of boats will shortly be publicised in the UK and German Yachting magazines where they hope to make a big splash due to their excellent design, durability and very competitive prices. The PROTON is a one-man ballast yacht designed according to descriptions of International Class 2.4 m. The construction of the boats gives it unique water resistance , which results in speed and good turning abilities. The PROTON is uncapsizable and unsinkable. 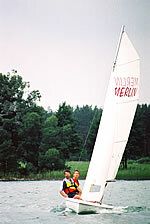 The Proton is excellent for helmsman of all other classes as a training boat used to improve tactics and sailing technique, because of it's ability to have various rigging adjustments and no need of body ballasting. It's hull is built of glass fiber reinforced plastic with heavy-duty construction and a special structure which increases it's endurance, durability and strength. The yacht is uncapsizable thanks to a weighted Keel and unsinkable because of the displacement chambers filled with foam plastic. The yacht is equipped with two limber pumps - one of them is electric and one manual. During the design process of the Proton special attention was paid to ergonomy. The helmsman seat is able to regulate forward and backward. All the ropes of rigging are accessible within reach of hand and able to lock in a convenient way. For controlling a rudder the sailor can use pedals or a hand tiller located in front of him. Sailing on the Proton is a thrill. The yacht is very fast and good turning, additionally placement of the helmsman head just over the waterline, brings unforgettable experience of sailing. Our company sells complete, ready to sail yachts, with sails and all necessary equipment. Together with the Proton you will get a multifunctional rack, which is intended, for transporting and storing this sailboat. The Bravo is fast, has good turning ability and is very safe. Kama are sure that it will never let you down and will let you discover the true taste of yachting. The Pooh is a DIY sailing boat made of plywood. The Pooh is a small do-it-yourself sailing boat of plywood, designed for those wishing to construct their first boat on their own. Kama used a special method of hull making to reduce the amount of work in comparison with the traditional method and to facilitate the job, even for beginner shipwrights. The first yachts of that type were made in 1985. Now it is even easier to build the boat, as all materials are generally available in stores. The Froggy is a very simple DIY sailing boat made of plywood, with a gaff rig. The FROGGY is a small non-sporting yacht for a crew of two. The hull is made of plywood by "stitch and glue" method, which reduces the amount of work by two times as compared with traditional methods, and makes the work easy even for a beginner shipwright. FROGGY has gaff rig with wooden spars and dagger board, which simplifies the construction even more and additionally reduces the cost. 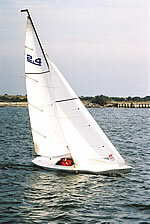 The design for "Froggy" was developed in 1982 and since then tens of such yachts were built, confirming that Froggy is easy to make and fun to sail with.